This thesis studies the relationship between the public and science, focusing on the role and the perspective of the public. While the empirical case studies focus on genomics and biotechnology, the analysis of conceptual models of science communicaion contains relevant lessons for the current debate on nanotechnology. The thesis argues that the ‘deficit’ and ‘interactive science’ models of science communication are not mutually exclusive. 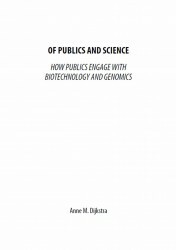 Thesis Anne Dijkstra: Of publics and science: how publics engage with biotechnology and genomics (pdf file on utwente.nl, last accessed 16 Dec 2013).